Copper Lincoln pennies arranged by darkening shades of red to brown. To accurately grade copper coins, you must be able to describe the color of the copper. Over time the brilliant orange/red color of a freshly minted copper coin, such as a Lincoln cent, will diminish and fade to a deep chocolate brown color. As this degradation of color occurs, there are varying degrees in which both red and brown colors will exist simultaneously on the surface of the coin. This color designation only applies to uncirculated copper coins. All circulated copper coins are assumed to be "brown." Additionally, depending upon the environment where you store your copper coins, the surface of the copper may turn different colors. These toned coins can be beautiful or ugly. Some copper coins may take on an iridescent golden red. Others may turn deep red with hints of blue and indigo. These beautiful tone colors usually happen over long-term storage in less than optimal coin holders. However, these beautifully toned coins are highly prized by collectors, and they will pay a premium. Other coins may turn dark green or have splotchy black areas. Improperly storing your coins will also cause this ugly toning. Coin collectors shun these ugly coins, and they will not carry the value of a bright orange or beautifully iridescent toned coin. Be careful when purchasing toned coins. It is easy for coin doctors to use chemicals to replicate beautifully toned coins. However, an expert numismatist will be able to tell if the beautiful toning is natural or artificial. 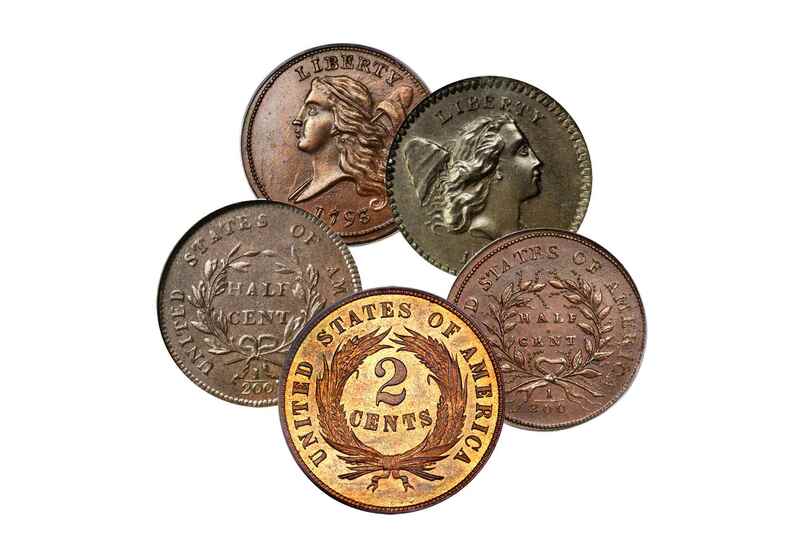 Artificially toned coins are considered damaged and will reduce the value of the coin. Accurately describing the color of your copper coins will help you build a better collection. Copper is an element with a chemical symbol of "Cu." Compared to other metals, copper is soft, malleable and ideal for the minting of coins since it exists in great abundance. Pure copper has a bright reddish orange color. Unfortunately, copper is also highly reactive to chemicals naturally found in our atmosphere. Oxygen, water vapor, and various acids react with the copper and cause it to tarnish. This oxidation, combined with other chemical reactions, results in its natural bright reddish orange color to gradually turn into a deep chocolate brown color known as patina. A copper coin when first struck exhibits a lustrous reddish orange color. These specimens are prized by coin collectors and carry a value premium over identical coins that are starting to turn brown. Most coin collectors will agree that if a copper coin has retained about 90% of its original orange-red color it will be designated as "Red" and abbreviated in its grade as "RD". Once oxidation and chemical reactions start to occur on the surface of the copper coin, its color will start to change from reddish orange to brown. 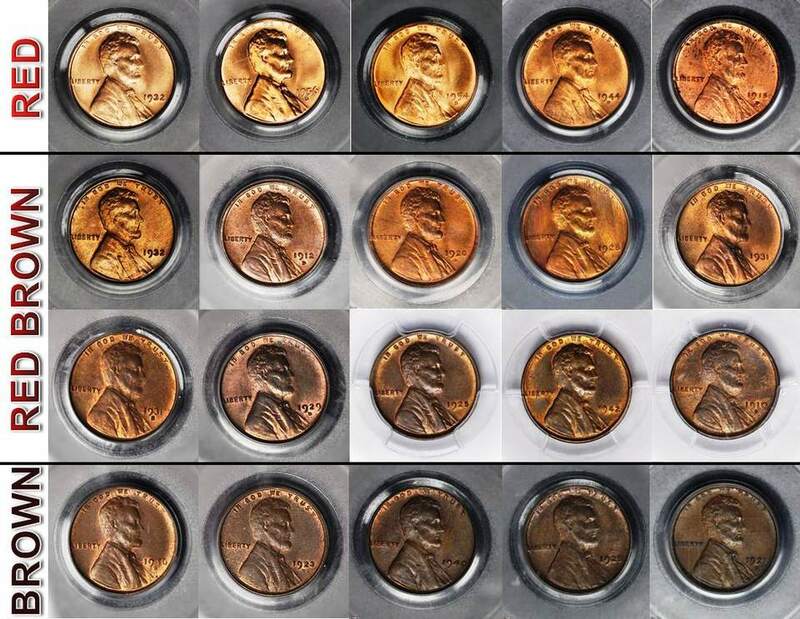 This may include some areas of the coin that are approaching a chocolate brown color while other areas still have some of the original reddish orange color. A common measurement is that between 10% and 90% of the original orange-red color remains. This is termed as a "red brown" coin and is abbreviated as "RB" on coin grading descriptions. When a majority of the coin's surface has reacted with the atmosphere such that the surface of the coin is almost entirely a chocolate brown color, this is considered a "brown" coin and is designated as "BN" on grading descriptions. Many ancient copper coins are recovered from being buried in the ground. The chemicals found in soil react with a copper and cause oxidation that is green in color. On ancient coins this is acceptable and usually noted with the coin's grade. Unfortunately, green oxidation on United States coins is considered damage and renders the coin ungradable. Grading the color of copper coins is very subjective, especially when the color is on the boundary between shades. The chart at the left shows twenty coins representing the various shades of red (R), red and brown (RB), and brown (B). Remember that computer photos do not capture the exact color of the coins, so you may notice some inconsistency from one computer to another. Is That Coin Authentic? Here's How to Find out.